CT Scanner Market size is set to exceed USD 7 billion by 2025; according to a new research report by Global Market Insights. Rising prevalence of cardiovascular diseases (CVD) globally will drive CT scanner market over the forecast period. According to WHO, in 2016, around 17.9 million people died due to CVD. CT scanner offers multiple benefits in diagnosis and treatment of CVD that will stimulate its demand. Also, scans generated through cone beam allows healthcare providers to obtain images of heart valves and arteries that accurately predicts blockage increasing success rates of surgeries. Moreover, increasing awareness about early disease diagnosis in emerging economies will further accelerate demand for CT scanners. O-arm segment held 60.4% revenue share in 2018 and is estimated dominate industry owing to extensive usage of o-arm in diagnosis of several chronic conditions. It is widely preferred for assessing pedicle screw position in spine surgeries and kyphoplasty procedures. Moreover, O-arm is a cone beam imaging system that is highly preferred in minimally invasive vascular surgeries. As reported by Society for Vascular Surgery, around 14,000 Americans die annually from ruptured abdominal aortic aneurysm that escalates the adoption of O-arm scanners proving beneficial for the segmental growth. Stationary CT scanner is expected to have 5.4% growth throughout the analysis timeframe owing to the adoption of stationary CT scanners in hospitals that carry out large number of scans every year. Well-established hospitals find it convenient to assemble stationary CT scanners that have exceptional capacity and efficiency though they occupy larger space. Also, in developed countries, public hospitals are forced by the regional government authorities to adopt stationary CT scanners as results generated by these scanners reliable as compared to the portable CT scanners that stimulates the segmental growth. Mid-slice segment was valued at USD 1.4 billion in 2018 and it will grow considerably during analysis timeframe due to availability of CT scanners that deliver mid-slice assortment of images enabling efficient surgical treatment. Mid-slice CT scanners include scanners with 16-40 slices that possess considerable diagnostic accuracy with minimum exposure to radiations that substantially boosts its adoption. Moreover, frequent launch and approval of advanced CT scanners that delivers mid-slice range will fuel segment growth. Human segment held 75.9% revenue share in 2018 owing to growing adoption of CT scanner in diagnosis of chronic diseases. Equipment not only detects presence of tumor but also delivers detailed information about location and size of the tumor. Advantages offered by CT scanner includes improved cancer diagnosis and treatment decision, reducing surgery time as well as length of hospitalizations. Aforementioned advantages of CT scanners are expected to propel the segmental growth. Hospital segment is expected to show 5.3% growth during analysis timeframe. CT scanner is used in disease diagnosis, treatment and also for studying disease progression. It also provides guidance during surgery and help locating appropriate part for operation, thereby preserving delicate structures. Therefore, hospitals have high adoption of technologically advanced CT scanners. For instance, Kirkland Lake Gold donated USD 3.2 million in April 2018 to install 128-slice CT scanner in Kirkland and District Hospital of Canada. 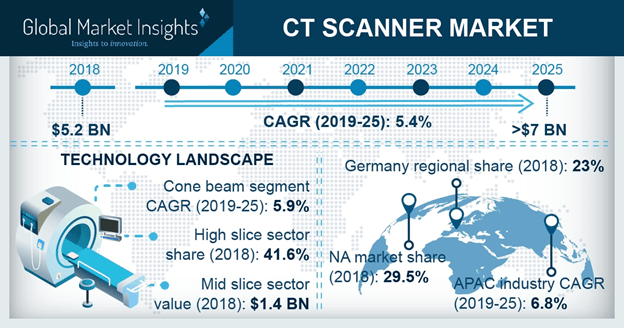 Germany CT scanner market held 23% revenue share of Europe CT scanners market in 2018 and country growth is driven by technological advancements in portable CT scanner and high adoption of CT scanners in mobile stroke units in the country. Furthermore, significant R&D investment to develop superior CT scanning equipment with enhanced applications will augment industry size in the future. Moreover, German scientists have developed an innovative new scanner to revolutionize cancer diagnosis. The newly developed technology can give resolution of 100 nanometers, making the examination quicker and exposing patients to less radiation. Therefore, efforts in R&D will favor the Germany CT scanner market growth. Mexico CT scanner market was valued at USD 34.8 million in 2018. Adoption of cone beam technology for disease diagnosis is increasing steadily that should augment the country growth. CT scanners market is still in nascent stage in Mexico. Hence, new entrants have ample opportunities to grab market share by penetrating with low-cost CT scanners. Some of the notable industry players operating in global CT Scanner market are Canon Medical Systems Corporation (Toshiba), CurveBeam, Hitachi Medical Corporation, Koninklijke Philips, Neusoft, Samsung, Shenzhen Anke High-Tech, Xoran Technologies, United Imaging, Siemens Healthineers, Planmed Oy, Medtronic, Koning Corporation, GE Healthcare, Carestream and Accuray. Industry players are focusing on R&D activities to develop innovative product delivering superior image quality in less cost. For instance, in March 2017, GE Healthcare launched CardioGraphe, a cardiovascular CT system to broaden product portfolio as well as sustain its leading position in the industry.